Stress Engineering Services has a long and successful history of working with customers to reduce product costs without sacrificing performance. 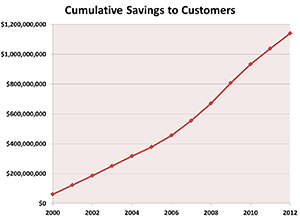 Since 2000, we have helped our customers save over one billion dollars! Our broad mix of projects, experience, and skill-sets are the key to our customers’ significant cost savings for a range of products. In the consumer products industry, our failure remediation work represents a significant component in our ability to help our customers implement cost savings successfully. Along with performing engineering design and analysis, we have a large internal knowledge-base for failure analysis in a variety of industries and applications. Based on our history of implementing cost-savings projects, we have discovered that each of the following four areas represents a significant opportunity to reduce costs. 1. Optimization of Current Systems – In this area, we examine both the economics and engineering of the product. We have developed sophisticated cost models to estimate the optimal cost for manufactured components. Based on key cost drivers from the economic analysis, we are able to focus on the opportunity to re-engineer portions of the assembly. Our engineers rely on the material failure logic models (MFLM) to ensure that the recommended options can be successful while also identifying any potential downsides. 2. Implementation of New Technologies – In conjunction with Optimization of Current Systems, we can consider newer technologies that have been developed since the launching of the initial product. We often find that newer technologies exist that can lower costs and/or improve reliability. 3. Changes in Product Specifications – As product needs evolve over time, it may become apparent that certain components are “over–engineered” and have been “grandfathered” into the design. When this is the case, the door is open to implement design changes that could deliver cost savings. These types of changes are typically driven by the requirements change. 4. Changes in Purchasing Strategies – Beyond engineering changes, there are traditional purchasing strategies that can deliver significant savings. We can help provide the true cost for components and provide specific talking points for current suppliers on what the real price should be. In addition, we can explore strategies and options for the best manufacturing locations (including guidance on international locations). Traditionally, medical customers are primarily focused on reliability and safety. This attitude is driven by the fact that the downside of failure is high. For disposable components, the cost of a consumable item can be only a fraction of the cost of the instruments they interact with, again shifting the focus toward reliability and safety versus cost.